I only bought a single article of clothing during the clearance sales of January. Next year, I will try to budget so I can take advantage of the significant savings on cashmere, perhaps a black v-neck sweater or black crew-neck cardigan... Anyway, my sole purchase was a particular piece that I have had my eye on for a long while. 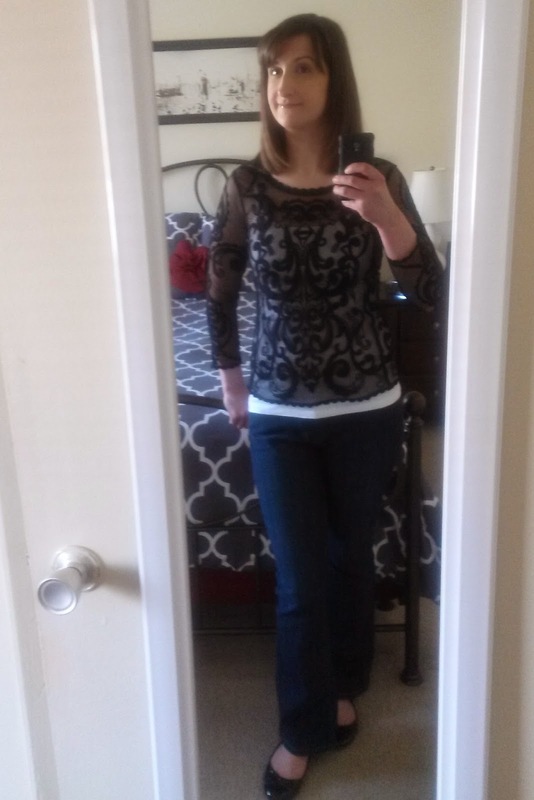 I ordered this black sheer Baroque Lace Tee with scalloped edges from Express online. (The black is no longer available, but three other colors are.) It's called "Baroque," the name of my favorite period of art history. As it is ornate, it is a bit of a fashion risk for me. The top fits me like a glove and is actually a bit too tight in the arms. It is too cold to wear it during the winter, so maybe I will during the spring, but, then again, if I tone my arms, it'll fit more comfortably and you'll see it as part of my Fall Capsule Wardrobe... I plan to style it with a black camisole underneath, so that the bold damask design is more subtle. Or maybe I'll consider buying a charcoal gray camisole. It is interesting, but I hope it is sophisticated as well. just so you could see the design which embellishes the front, back and sleeves. 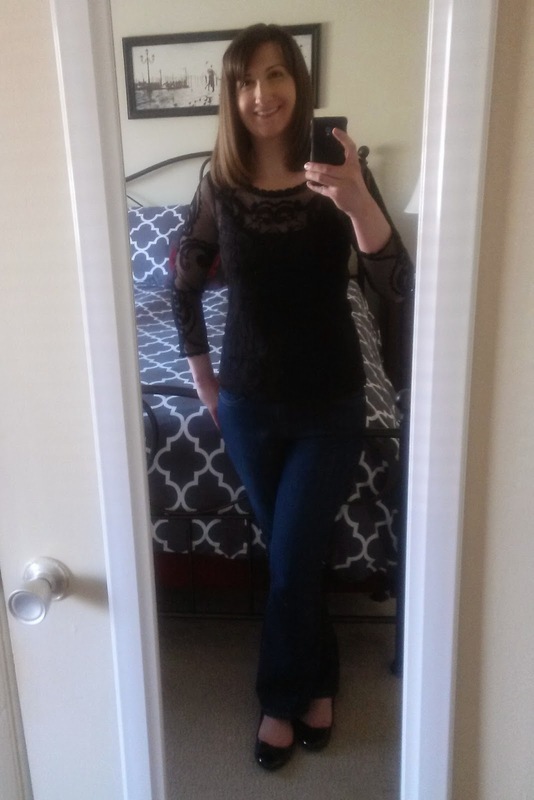 over a black cami with bootcut jeans and black ballet flats. 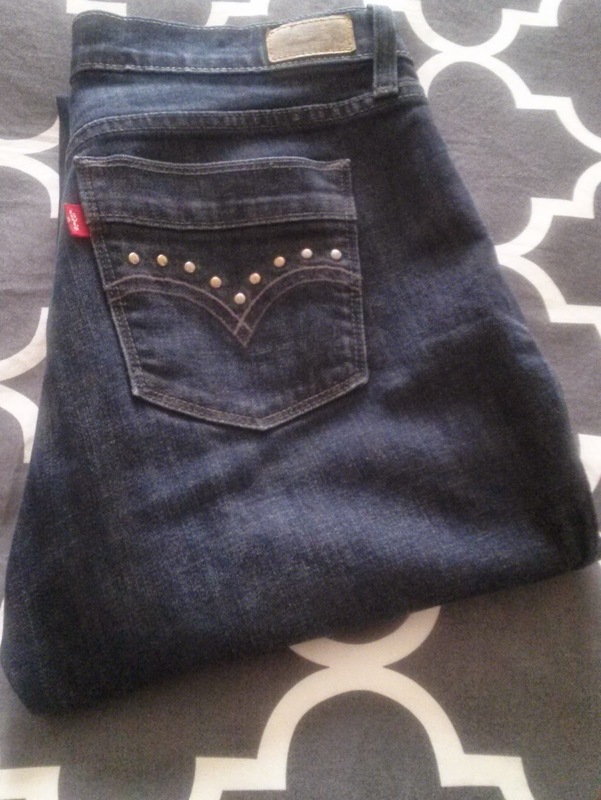 I also recently bought the pair of jeans featured above. In searching the internet for blue jeans that I could pair with heels, I happened to come across this pair with its 29-inch inseam to style with flats on eBay. Recognizing the studded back pockets, this is similar to two pairs I bought from Kohl's for my last trip to Italy in 2011. I dislike the contrast golden stitching usually found on dark wash jeans, so I am pleased with these and their gray stitches. They are a bit of a heavier weight which is nice for this really cold winter we've been having. Levi's 515 jeans are my 'go to' and I actually didn't own a pair of this brand in my winter wardrobe. Honestly, since I do not have my own washer and dryer, three pairs of jeans is so much better than the two I've been working with this winter. This is a fantastic addition to my closet. I scored these for under $28, which isn't a steal, but I would probably pay $10 more for a new pair I liked less in a store. In excellent condition, these were officially "pre-owned" but it's like they have never been worn, not a curve nor wrinkle in the waistline. I feel very fortunate to have found them. I think this is my third eBay purchase ever and I have always been very pleased. I bought them from this eBay seller who also got them to me very quickly, even when ordering during a holiday weekend. I still need a pair with a 30" inseam to wear with heels! Perhaps I'll pick them up in birthday shopping during April. This picture was taken after wearing them a couple of times. The baroque blouse is lovely and your outfit is simple yet stylish....Love it! I actually like it with the white camisole, it makes it look casual so you would have more options on where to wear it. It looks great with black underneath it too. Harriet, I will consider wearing it with a white camisole, just one that is not so much longer than the shirt itself. It might be my casual yet artsy 'go to' look for perhaps a First Friday of art galleries or something like that... Grazie!